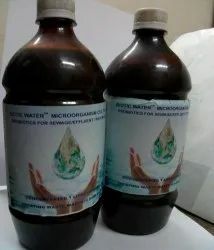 Biotic Water Offers extremley efficient EM (Effective Microorganism) solution, which can be readily used to commission Sewage & Effluent Treatment Plants. Readily available and extremely easy to use. Our 1 Litre of concentrated EM solution is diluted to prepare 20 lits. of EM solution and then can be readily used in the Equalization Tanks/ aeration Tank. Use of our EM solution will drastically reduce the commissioning time of the Sewage Treatment Plants and keep the treatment plants trouble free. Looking for Sewage Treatment Chemicals ?